Retrospective curated by Emily King at Gallery Libby Sellers. 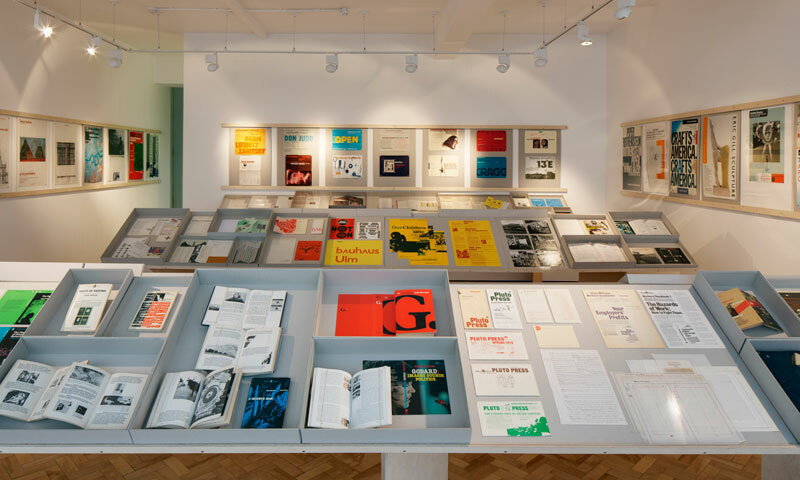 Commission to design & fabricate the exhibition display for a retrospective consisting of almost 300 pieces from the archive of graphic designer Richard Hollis. Hollis' work is often economical yet inventive in its use of colours, inks & paper stock and he believes that the designer's role is to find expedient but delightful solutions to their clients' briefs. The design of this show attempted to be similarly sparing by using low cost materials creatively to make an exhibition which showcases the extensive array of work at a glance & allows detailed study of the individual pieces. By using two simple elements which are easily constructed / demounted & can be set up in different spaces without much adaptation, this design is also well suited for the different locations the exhibition is planned for. The installation consists of sloping display tables & wall mounted poster rails. 12mm plywood lengths are continuously hinged along the central spine & placed over similarly hinged plywood supports, with the fold lending them spanning length & stability. The bottom edges of the tables are further strengthened by plywood lippings which also act as a stop to hold the displays in place. This structural solution means that the exhibits are angled towards the visitor, making them easier to view than if they were on a flat surface. The content of the show is displayed & organised on a background of grey unlined cardboard - as sheets for 2D pieces (protected with the same size perspex if required) or shallow boxes with a perspex cover for 3D pieces. Based on the standard B size system, these sheets & boxes ranging from B1 landscape down to B4 portrait tesselate to cover the table tops. This method of display creates a framework for the curator to organise & group displays of work, allowing maximum flexibility for the arrangements to be shuffled & finessed during installation. Posters are secured using back to back magnets - either to the front of grey card or to the rear of perspex if protection is required. These then simply slide onto wall mounted plywood rails. Built and installed with Jack Neville; graphic design by Sara de Bondt; photography by Ed Reeve. A version of the exhibition has since travelled to theCentre Pompidou, Paris in February 2013; ECAL, Lausanne in April 2013; & Artists Space, New York in September 2013.